The nanny / employer relationship is an intimate and often emotional one. Establishing boundaries and expectations upfront can provide clarity and structure to the working relationship. While a verbal agreement may feel like a suitable way to enter into the nanny / employer relationship, having a written work agreement is essential to building and maintaining a professional working relationship. 1. Who the employment agreement is between. Be sure that the names of both the legal employer and the nanny are included in the agreement. 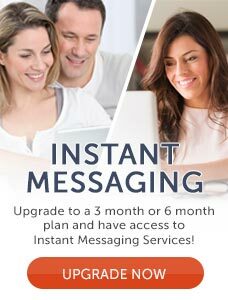 Be sure the names are typed or printed legibly and that both parties initial all pages and sign on the appropriate signature line at the end of all text. 2. Dates of agreement. Include the start and end dates of the agreement, including the time frame of any trial periods. For employees in at-will states, having a written end date may remove them from at-will status. 3. Pay rate. Now is the time to clearly spell out the monetary compensation package that you have agreed to. In addition to hourly pay rate, the pay rate for overtime hours, travel work, overnight hours, babysitting and on-call hours should be included. When determining your pay rate, be sure to comply with Federal and State labor laws. 4. Pay schedule. Include how often your nanny will be paid (weekly, bi-weekly). The payment type (check or direct deposit, for example) should also be included. 5. Tax responsibilities. Indicate in your written agreement the tax responsibilities of both the nanny and the employer. Be sure to include if the employer will voluntary be withholding and paying the nanny’s portion of taxes. 6. Work schedule. Outline the days and hours that make up the nanny’s work week. If flexibility is required, be sure to be specific about how much flexibility is needed and include what days and time frames require the most flexibility. 8. Responsibilities. Reflect on what you want the nanny to be responsible for and write out those responsibilities in bullet form. These may include things like prepare the children’s meals, schedule play dates, transport the children to school, keep a daily log and maintain a safe play environment. 9. Benefits. Consider what benefits you are offering the nanny and list them out one by one. Benefits may include paid vacation, holidays, sick days, personal days, health insurance contributions, professional days, educational reimbursement, retirement, health club membership and any other benefits you are offering. 10. House rules. It is always good for everyone to be clear on the house rules. Include any rooms that are off limits, how any foods are to be handled (for example in families with allergies or in families who keep Kosher), parking arrangements, children’s screen time restrictions, how the phone is to be answered, policy on guests and play dates and any other items that govern how you operate your home. 11. Car use and insurance. Clarify what vehicle will be used to transport the children, who will provide it and who is to pay for gas and maintenance. If the nanny is using her vehicle, she should be reimbursed according to the current IRS mileage reimbursement rate. The nanny should also provide proof of insurance, indicating that her policy covers transporting children for work. If the employer furnishes the vehicle, be sure the nanny is added to the auto policy. You’ll also want to indicate who is responsible for insurance premiums and the insurance deductable, should an accident occur while the nanny is on the job. 12. Confidentiality clause. Some families wish to include a confidentiality clause that includes what can and cannot be shared about the employment arrangement and the employing family with others. This may also include the directive not to use family photos or names in social media. 13. Reasons for termination. The written work agreement should include reasons for termination, both for cause and for no cause. Any severance agreements and that amount of notice agreed to should be included. The agreement should also include the procedure that is to be followed should the nanny wish to end the agreement early. 14. Electronics usage. With electronics so readily accessible, some employers prefer to stipulate how much time the nanny is authorized to spend on the phone and on the computer during working hours. Some employer’s allow use during nap times and others allow the use for emergencies only. Clearly state your position on personal electronics usage during working hours in your work agreement. 15. Relocation clause. While it may not be foreseeable, agreeing to some basic guidelines should the employer or nanny have to relocate during the employment relationship can help to guide both the nanny and employer through the process. 16. Evaluation schedule. Include if you will be having weekly or monthly meetings and if you’ll be holding quarterly or annual performance reviews. Having a set time to discuss the employment relationship can help prevent any tension from building. 17. How to amend the agreement. Including a statement on how the agreement can be amended can provide clarity on how to proceed when changes to the agreement are needed. 18. The emergency plan. Writing out an emergency plan can help facilitate appropriate emergency responses. Choose an out of state contact that both the nanny and employer can contact should a personal connection not be secured. You may also wish to consider securing a safe meeting place should your home be inaccessible during an emergency. 19. Authorization to treat. Including an authorization to treat a minor form as part of you work agreement package can be sure that this essential tool is completed and ready prior to the start of the working relationship. Include permission for your child to be treated by emergency personnel should you not be able to be reached and include your pediatrician’s contact and children’s health insurance information, as well as all of both parents’ contact information. Include any other pertinent medial information including past surgeries and allergies. You may also wish to consider keeping a copy of the authorization to treat on file in your pediatrician’s office. 20. Live-in accommodations. If you are employing a live-in nanny, be sure to clearly articulate what is included in her accommodations, how meals and food are to be handled and which utilities you are providing. While writing the nanny / employer work agreement may seem like a tedious project, doing so will prevent miscommunications and provide a reference to look back to if problems or questions arise. Michelle LaRowe is the 2004 International Nanny Association Nanny of the Year and author of Nanny to the Rescue!, Working Mom’s 411 and A Mom’s Ultimate Book of Lists. Please also note that families that find nannies through eNannySource.com get access to our legally reviewed nanny employment agreement that is pre-populated with all of the information from your prospective caregiver. Awesome post! Work agreements are crucial! I am printing out this list and keeping it in my file of important things to remember – I’ve never had a written work agreement before, but I see why they’re so important! 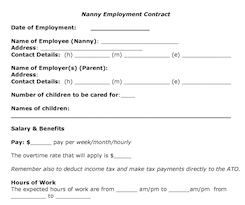 So glad you provide enannysource members with a copy of nanny employment agreement – I wouldn’t even know where to begin if it weren’t for you guys! Your customer service is outstanding! It’s also a good idea to keep this and any other documents (emergency contact info, food instructions, authorization to treat, etc) in a folder or binder that can be easily referred back to and both parties should have a copy of all the paperwork. That way everyone is always on the same page. Interesting to include the relocation clause… I would have never thought of that one. The rest seem fairly basic, but that one is new to me. Will be adding it in the future.